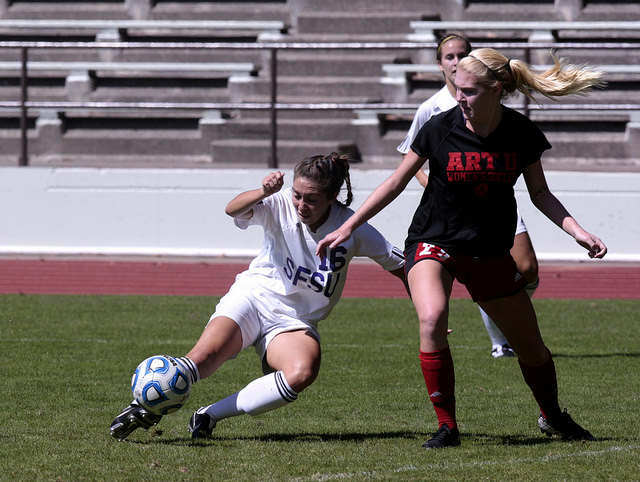 SF State’s women’s soccer team kicked off its 2014 season in a winning fashion today after a close 2-1 victory against cross-city rivals the Urban Knights, from Academy of Art. The story behind the Gators’ hot start lies in it’s offensive production, which already has two goals this season and looks to carry its momentum ahead after a league-worst 10 combined goals last season. The game started slow when both teams played a chess match at midfield, but opened up at the 6’ mark when SF State forward Autumn Fox nailed the first goal of the game with an assist by Ceja. The Gators dominated the time of possession in the first half, thanks to an improved offense featuring Fox, Ceja and defender Graceann Rettig, who relentlessly attacked Academy of Art’s defense. The first half had eight Gator shots on goal, while Academy of Art had three. Goalkeeper Allison Land seemed like a spectator with little to do on the field as the Gators’ stellar defense, anchored by defender Rettig, stifled Academy of Art’s offense. By halftime, the Gators had a 1-0 lead over the Urban Knights, but the second half saw a seemingly different team, with the Gators losing their momentum. Five minutes into the second half, Academy of Art forward Rea Laudat equalized the score at 1-1. After Laudat’s goal, however, the Gators’ speedy forwards picked up the offense, controlling most of the possession in the second half. The team had several opportunities to score but couldn’t take advantage. As the game wound down and appeared primed for a tie, midfielder, Brittany Oldham scored the game-winning-goal at the 75’ minute mark of a hard-fought game. Head Coach Jack Hyde was pleased with the team’s performance. However, he wants to see his team take advantage of more scoring opportunities. The Gators travel to Rocklin, Calif. to face William Jessup University on Tuesday.